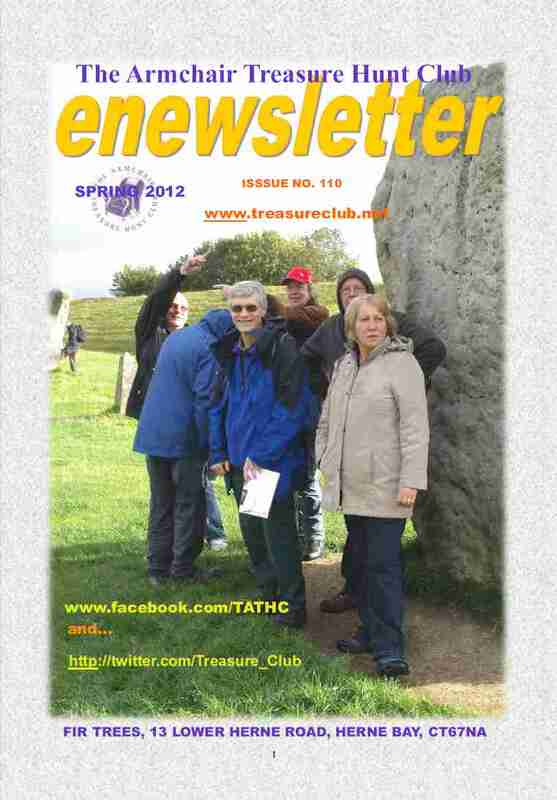 Cover Photo: Members of the club look for clues among the Sarsen stones during the Avebury Meeting treasure hunt. Puzzle Pages - Your chance to win real money with Andy’s puzzles. Tintabulation - Paul Harkin explains how he solved the charity treasure hunt. Three Letter Hunt 2012 - Pete Colbert continues the tradition. As winner of the last hunt, he sets a new one. Three Letter Hunt - Pete Colbert met up with Jonathan Wolff in Hatfield to unearth the treasure. One Word Hunt - A new hunt to enjoy from Mikey Smith. The Enchanted Garden - Charles brings us clues from this club hunt. 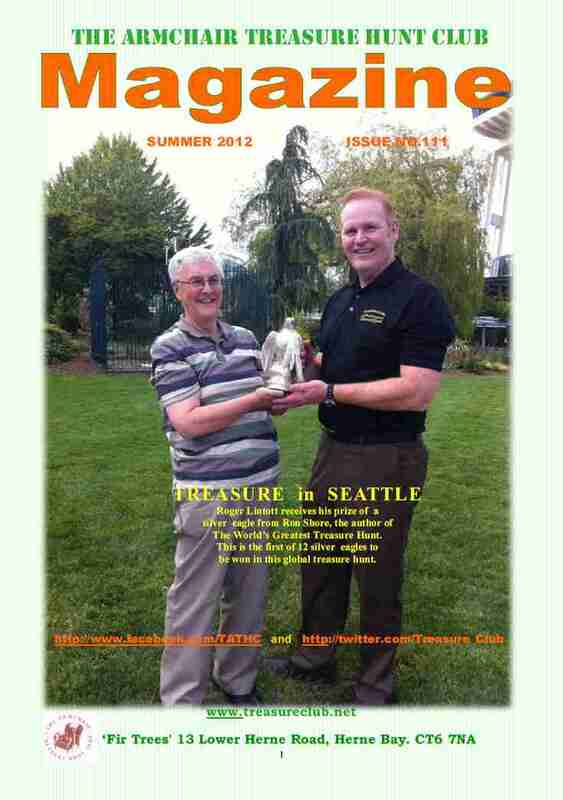 Logica - How did club members fare in the annual internet treasure hunt? The Hills are Alive - The latest info’ from the current club hunt. Cover Photo: Roger Lintott receives his prize of a silver eagle from Ron Shore, the author of The World's Greatest Treasure Hunt. This is the first of 12 silver eagles to be won in this global treasure hunt. Puzzle Pages - Your chance to win real money with Andy’s summer puzzles. Family Secrets - Ann and Sandra announce the club;s annula treasure hunt. The Great Global Hunt - Paul Harkin tells us how he submitted the correct solution to this hunt which had a massive 50,000 Euros prize. Bulletin Board - Simon gives us all the latest news. Lights, Camera, Action - Pete Colbert gives us the solution and tells us how he solved this four-part hunt. The Hills are Alive - Helen Cook is the first to find one of the three treasure sites in this club hunt. The Silver Eagle - Roger Lintott's story of a trip to Seattle to collect his prize in the World's Greatest Treasure Hunt. Club Meeting - Annika gives us details of a great day out for us all in Olney, Buckinghamshire. Cover Photo: The Winning team at Olney. Helen, Craig, Mary, Steve, Nick and Cynthia, show the wedding ring which they found underneath the arches. Andy's Puzzle Pages - Your chance to win real money with Andy’s puzzles. Club Meeting - Stories and pictures from the club's grand day out in Olney. Bulletin Board - Simon gives us the latest news and clues. Family Secrets - The first Red Herrings are found in Somerset. Hunt 4 a new member - More success in these popular hunts written especially for new members. Club Letterbox - Clve Weatherley gives us an update on the club's Dartmoor letterbox. 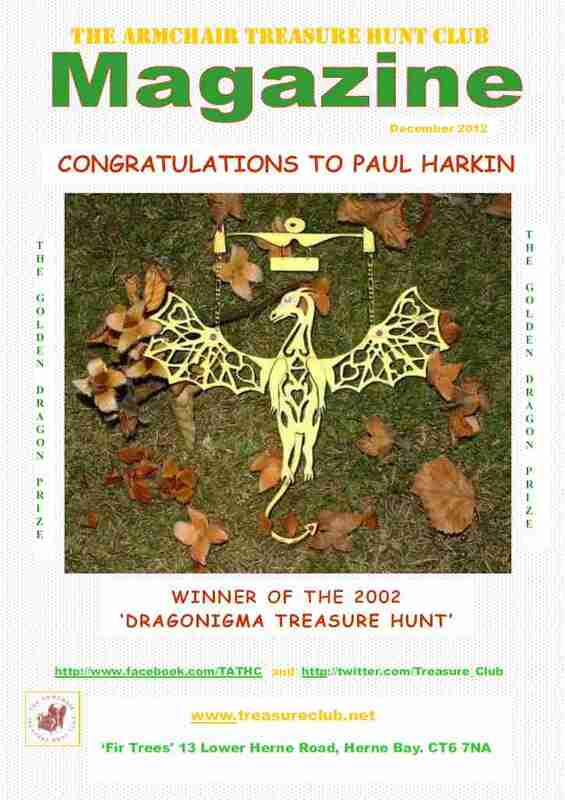 Dragonigma Solved - Paul Harkin announced as winner of this 10 year old hunt. 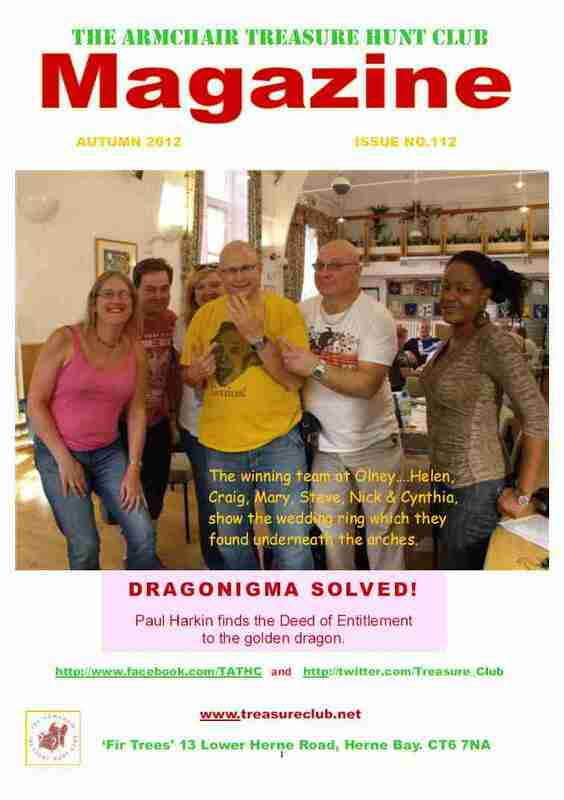 Dragonigma - Paul Harkin wins this major Internet Hunt which has lasted ten years. He tells us his story here. Andy's Puzzle Pages - Not one, but two ten pound puzzles for you to win. The Hills are Alive - The main treasure has been found by Pete Colbert and Helen Cook. Here they tell the story of how they walked those hills. However the hunt is not over, extra clues to the remaining treasures are here.